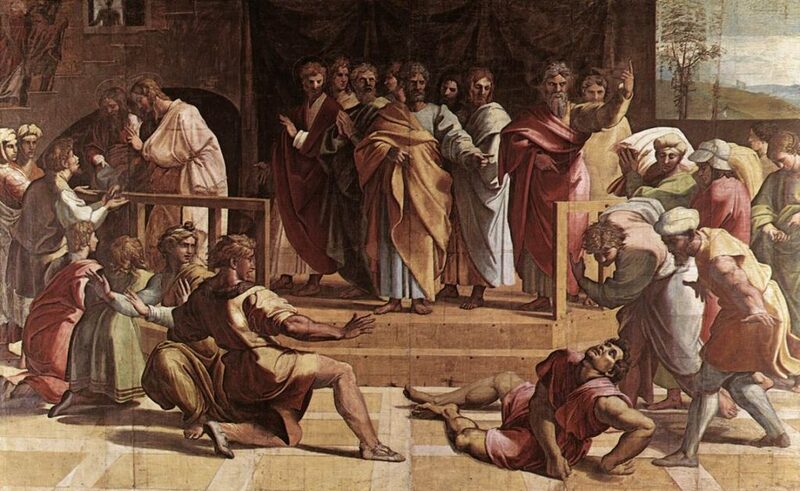 The Death of Ananias, by Raphael, 1515 A.D.
“All the believers were one in heart and mind,” recorded Dr. Luke (Luke 4:32). The lame man at the gate called Beautiful had been healed the day before. Shortly after the miracle, Peter and John had been arrested by the temple police and held overnight. The next morning at their trial is when Peter made his memorable statement that continues to live to this day: “Judge for yourselves whether it is right in God’s sight to obey you rather than God. For we cannot help speaking about what we have seen and heard” (Acts 4:19-20). Peter and John had refused to be intimidated when on trial before the Sanhedrin authorities, but Satan had another huge test planned. Here is how it came about. A prayer meeting followed the apostles’ release, led by Peter and John. The Holy Spirit in power fell on the group again, reminding us all that we need re-fillings of the Holy Spirit from time to time. The church was only an infant; the number of believers had climbed to about 5,000 worldwide. They enjoyed marvelous unity; in fact, “all the believers were one in heart and mind” (Acts 4:4). They did not even claim their property as their own, but freely “shared everything they had.” The mindset of these earliest believers was that “no needy persons” would be “among them.” In that social climate, the apostles “continued to testify with great power to the resurrection of the Lord Jesus, and much grace was upon them all” (4:32-34). Joseph was one such property owner. He was from Cyprus and a Levite. The disciples called him Barnabas, meaning Son of Encouragement, and as time moved forward, the name stuck. Joseph “sold a field he owned and brought the money and put it at the apostles’ feet” (4:36-37). A man named Ananias no doubt heard about Barnabas’ generosity and saw how much the apostles appreciated the gift. He visited with his wife about it, and he and Sapphira agreed to sell a property. But they also mutually decided to keep back part of the funds and share only part of the proceeds, which was their right to do. But they both wanted credit for giving the whole income from the sale, and it put them on a path of deceit and greed. Ananias and his wife surely thought Peter would never know the difference. It is also highly probable they thought they could get the credit and the Holy Spirit could be deceived too. When Ananias laid the money at the apostle feet, he claimed credit for giving the whole asset. He also woefully misjudged the Holy Spirit (5:1-2). Peter was a strong leader who was not bothered when the need arose to be confrontational. Peter said to him: “Ananias, how is it that Satan has filled your heart that you have lied to the Holy Spirit and have kept for yourself some of the money you received from the land. Didn’t it belong to you before it was sold? And after it was sold, wasn’t the money at your disposal? What made you think of doing such a thing? You have not lied to men but to God” (5:3-4). When Ananias heard this, he fell down and died! “Young men came forward, wrapped up his body, and carried him out and buried him” (5:5). It is a classic example of the gift of discerning of spirits. Peter asked her, “Tell me, is this the price you and Ananias got for the land?” (5:8). Peter said to her, “How could you agree to test the Spirit of the Lord? Look, the feet of the men who buried your husband are at the door, and they will carry you out also” (5:9). In the moment of Peter’s speaking, she fell down and died too, and the young men buried her beside her husband. This story also illustrates the Lord’s teaching on binding and loosing (Matthew 16:19; 18:18). The word of what happened spread rapidly in Jerusalem and “great fear” seized all who heard about it (5:11 KJV). The Greek words translated as “great fear” communicate the idea of mega or exceeding alarm. The word terrified also fits. The issue in this story is, who is this Holy Spirit and what is His power? The Apostle Peter made clear the Spirit is God; it is one of the strongest affirmations in the Bible of the Deity of the Holy Spirit and the Spirit’s place in the Godhead: “You have lied… to God,” Peter told Ananias. Deeper than the mutual lies of Ananias and his wife was Satan’s direct involved in the plot. Satan had set this couple up to test the Holy Spirit. Satan had been this involved in a similar plot against Jesus when he made his entrance into the Last Supper. Satan found Judas a willing vessel and possessed him, urging him to carry through with his betrayal of Jesus. At the Last Supper Satan was testing Jesus. Surely Jesus would stop Judas, and not let him follow through with his plan – but He did not. Jesus was willingly headed to a cross, and no scheme of Satan would stop Him. In this story in Acts 5, Satan was testing the Holy Spirit. Peter spoke God’s answer to Ananias: “Satan has filled your heart that you have lied to the Holy Spirit” (5:3). Interestingly, one of the defenses Jesus used against Satan in His forty days in the wilderness was “do not put the Lord your God to the test” (Matthew 4:7; Luke 4:12). If you do, you will be the big loser. Yes, this scenario was more than lies being told by a couple in the infant church wanting to get false and undeserved praise and acclamation. It was a Satanic test of the Holy Spirit, and Ananias and Sapphira became willing pawns (5:9). In their greed and quest for the praise of men, they simply did not believe Peter or the Holy Spirit would know the difference. This story also shows how the Holy Spirit talks to people, shares information, and gives instructions. Peter obviously did not know the facts until he discerned them by the Holy Spirit; then Peter confronted first Ananias, followed by his wife. Some think this was a harsh penalty, but not so. The Holy Spirit cannot be lied to and is not to be trifled with. If Satan had won that round, the Holy Spirit would have been proven as limited and weak, and no match for Satan’s schemes. Peter too would have come through as a weak leader who did not know what was going on behind the scenes. When the truth had come out, as it always does, Peter would have been very embarrassed for giving honor in Jesus’ name to a couple for a gift that was wrapped in a lie. Failure here would have been a heavy blow to the Early Church. But the Holy Spirit did not fail the test. The result was the apostles continued to perform “many miraculous signs and wonders among the people. More and more men and women believed in the Lord and were added to their number. As a result, people brought the sick into the streets and laid them on beds and mats so that at least Peter’s shadow might fall on some of them as he passed by. Crowds gathered also from the towns around Jerusalem, bringing their sick and those tormented by evil spirits, and all of them were healed” (5:12-16). The Holy Spirit established in those moments His claim as all-knowing Deity; the Spirit is God and cannot be deceived. A new Spirit was in the earth and living in the hearts of the apostles. The Holy Spirit enabled the Apostle Peter to discern and to bind and loose. That Spirit was leading the apostles and their followers in the Early Church. Jesus Himself identified the Holy Spirit as the Spirit of Truth (John 14:17). It meant Satan and the gates of hell could not prevail against the church. Satan had no weapons with which to stop the forward march of the Holy Spirit. The Gospel would indeed go to the ends of the earth.